I couldn’t have picked a better time to decide to start this blog. I mean, January, the season of New Year’s resolutions and general fresh starts. I think committing to this is a good way to kick of 2012, and it’s also a great way for me (selfish, selfish) keep up with what I’m up to. So what is this? What’s the point? Well, I’m a new knitter…sort of. My very first knitting attempt was at the age of 8. My grandmother handed me needles and some yarn, and I remember nothing else from this event. I picked it up again with a scarf at the Lutheran Youth Gathering in Texas a few years ago. That was fun and I got to tote around bamboo knitting needles and turquoise yarn as we walked the expo exhibits. Unfortunately, the scarf was never finished and it was so terrible (as the lady at the knitting booth only taught me to cast on and knit, not to avoid dropping or adding too many stitches) I threw the yarn-mess away. Fast forward to 2010, I give it another go. Always jumping feet first, I decide to knit a beautiful cable blanket, pattern from Bernat. Smart! I made it at least 1.5 feet, maybe a little longer. Boredom kicked in and I have yet to finish this project. I will note, however, that I have not thrown it away. It’s beautiful and mistake-laden, so my plan is eventually to just do the edging and have a nice lap blanket for me or stroller blanket for (distant) future mini-mes. Then, this past fall, my husband and I moved to our first (rented) place. 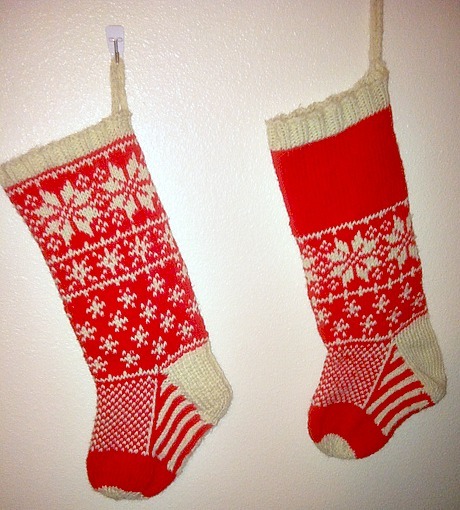 I decided he needed his first handmade stocking, and as I hate all store-bought stockings (my grandmother spoiled our family with beautiful hand-knit stockings very early in life), I decided I had to knit them. 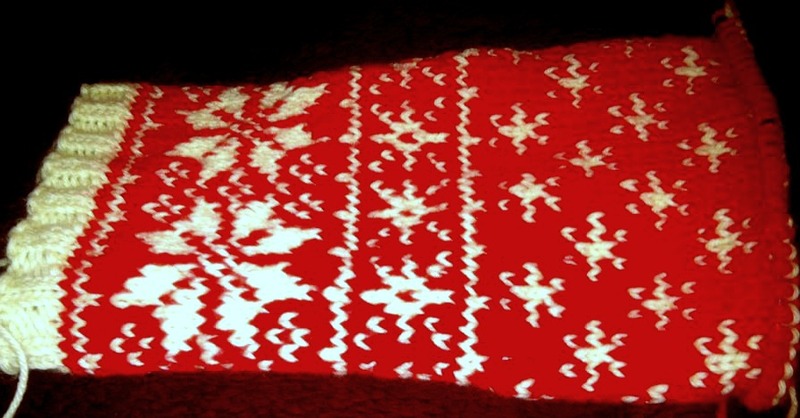 I chose a beautiful pattern called Falling Snow Stocking by Jennifer Hoel. At this point, though, I’m panicked. I couldn’t knit in the round, I had no idea how to do stranded colorwork, and the idea of socks scared me to death. Well, that and I had committed myself to finish this project by Christmas. Since the last Christmas stocking came off the needles, I’ve been hooked. Once one things comes off my needles, another must go on. I love knitting. It’s the thing that slows my mind down and helps me focus. I sit down with that and Kelly Petkun’s voice over the Knit Picks podcast (which I’ve been listening to since I lived in London back in 2008, despite not knowing how to knit or spin or even crochet at that point), and I can relax. So, here on this blog, I’m going to keep up with my WIPs and show off my FOs as a way to keep me going on this path to becoming a knitter. I’m excited to get started!